Christmas morning can be quite tricky when it comes to breakfast. 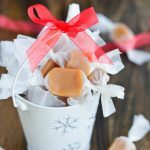 The kids wake at the crack of dawn and want to immediately start opening and playing with their gifts and by the time you’re done with the gift giving and opening everyone is famished but doesn’t want to wait longer or have to dirty up the kitchen. 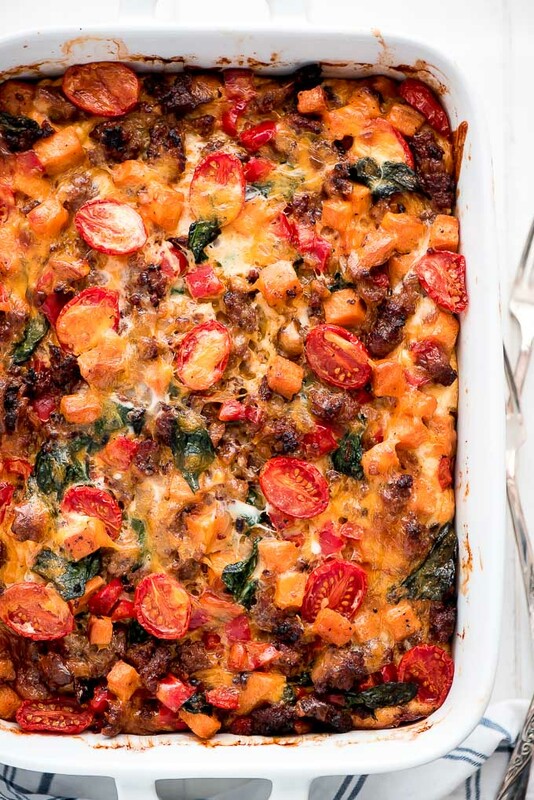 That’s when a delicious recipe like this Overnight Sweet Potato & Sausage Breakfast Casserole comes in to save Christmas day. My family has the tradition of eating Cinnamon Rolls and Quiche Christmas morning but I think I’m going to start making this Christmas Eve day. 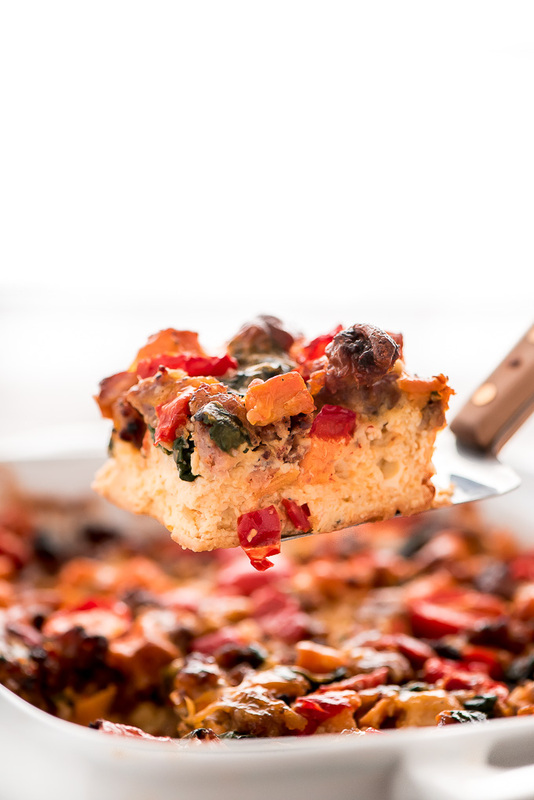 This breakfast casserole is loaded with veggies and eggs making it a filling and healthy way to start the day. And I need something healthy because there’s no way I’m giving up my cinnamon rolls. 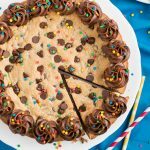 It’s you’re looking for more of a sweet overnight breakfast casserole, try Overnight Apple French Toast Casserole or Overnight Pumpkin French Toast Casserole. 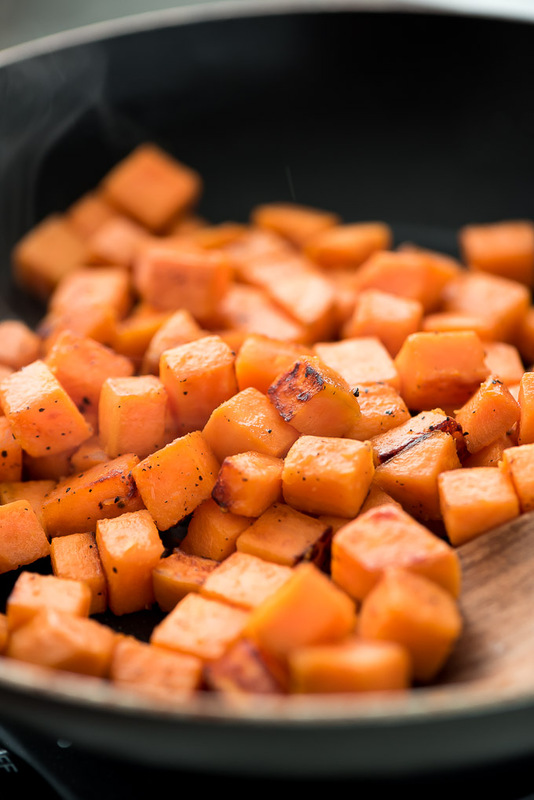 You can totally skip the sweet potatoes for this dish but I love the sweetness that they add. 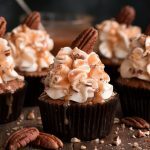 Feel free to sneak a few before adding it to the casserole. Sweet potatoes are so yummy! 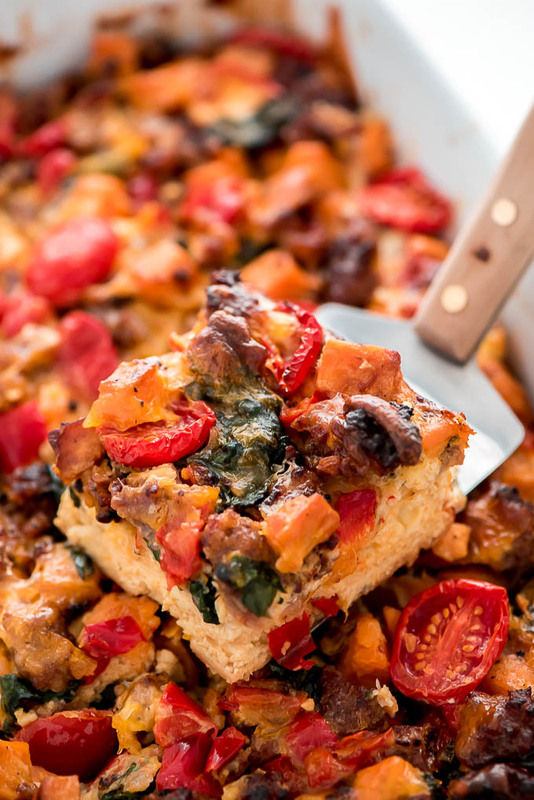 How gorgeous and color is this breakfast casserole. The first time I made it I couldn’t help but come back for seconds. 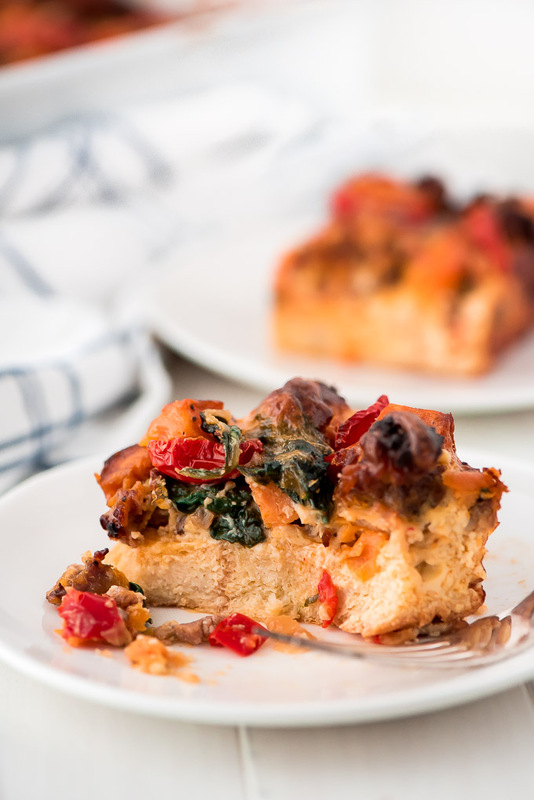 So delicious, filling, and makes for a super easy holiday morning. Enjoy! Potato Masher– Guys, I saw Rachel Ray use this and oh my gosh, it is life changing! I’m never using a wooden spoon to break up my ground meat ever again! Heat 2 teaspoons oil in the pan over medium-high heat. 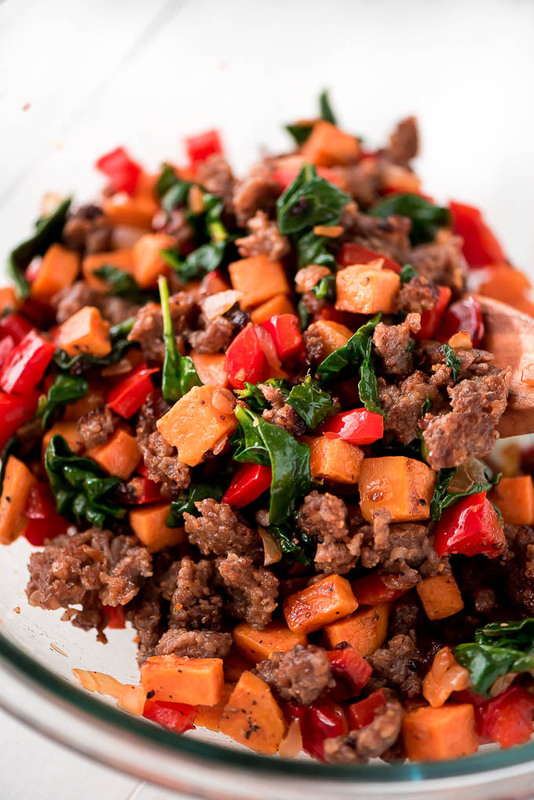 Add the sweet potatoes and toss to coat. Pout in the water and cover with lid. Cook for 5-7 minutes until fork tender, remove lid and cook until water evaporates and edges start to crisp. Remove from pan and set aside. Brown the sausage over medium-high heat. Remove from pan and add the remaining 2 teaspoons oil, bell peppers, and onion. Cook for 5-7 minutes until tender. Add the spinach and cook until wilted. 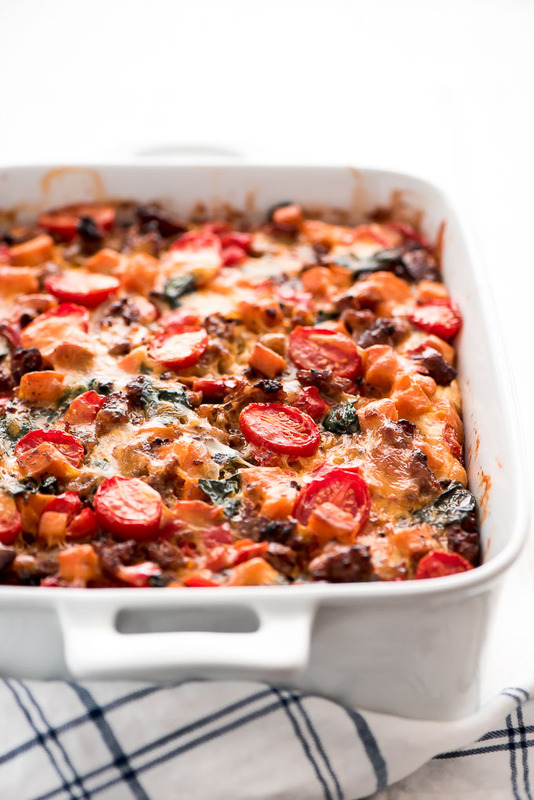 Mix in the sweet potatoes, sausage, and tomatoes and set aside. In a mixing bowl, whisk the eggs and then mix in the milk, ground mustard, salt, and pepper. Stir in the cheese. Pour half of the mixture evenly over the bread. 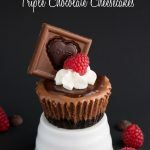 Oh my, this looks absolutely AMAZING! I don’t know how you made an egg casserole look pretty, but you did! I’m pinning this immediately, hope to try it soon. Haha! Thank you so much Allison!